What do you picture when you hear the word “money”? Some might see a bank account balance. To others, it might be a wallet full of notes and coins. We read recently about a Tel Aviv resident who wanted to surprise her elderly mother by buying her a new mattress, only to find out the old one she had just disposed of was stuffed with her entire $1 million inheritance. According to the FSCS (Financial Services Compensation Scheme) there is almost £7 billion stashed away in the UK too, with nearly 1 in 5 people storing “significant” sums of cash despite the risks. That’s why most savers store their cash in a bank account, reducing the physical risk and potentially earning some interest. But despite providing a sense of control, neither notes, coins nor even bank deposits are fully protected from one of the most prevalent yet unrecognised risks of holding money: inflation. By inflation we mean a general rise in the price of goods and services in the economy. Or, as US baseball player Sam Ewing eloquently put it, “inflation is when you pay fifteen dollars for the ten-dollar haircut you used to get for five dollars when you had hair”. A £1 coin will still have a nominal value of £1 in ten years’ time. But prices will tend to rise over those ten years so that the real value of that same coin will be less than £1, as it will afford you fewer goods and services. This may seem obvious but the impact on wealth held in cash can be startling, as shown in the following chart. Figure 1 above considers a situation much like our unfortunate mattress owner, whereby cash was locked away without earning any interest. Assuming the owner was in fact able to keep the cash secure, after 30 years they would have found it to be worth 63% less in real terms (i.e. after the effect of inflation, as measured by RPI). Cash can earn interest, but, as seen in Figure 2 below, often not enough to keep up with inflation. 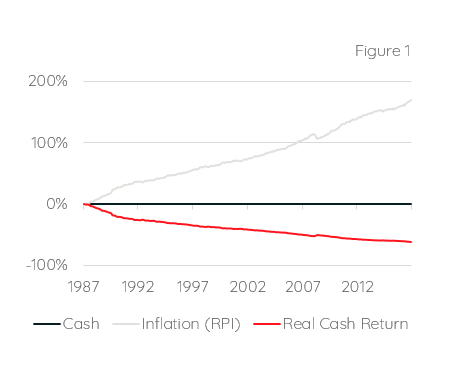 The last ten years in particular demonstrate the declining real value of cash when inflation levels are steady but interest rates low – a clear reduction in spending power. 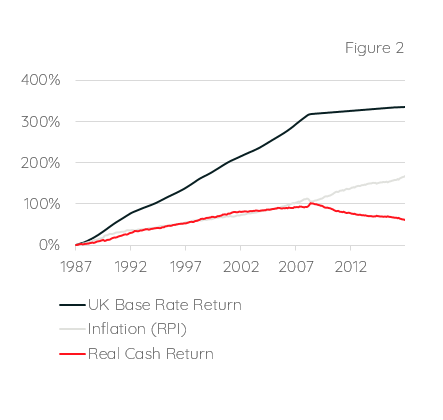 Over the entire period, the cumulative UK base-rate return is a ‘nominal’ 335%. In real terms however, this falls to just 61% simply due to inflation. The longer inflation is at work, the more likely it is to have a noticeable influence on the real value of cash assets. For individuals with longer term objectives for their savings it is therefore important to protect them from inflation, but cash is not the best type of assets to do that. One option is to diversify into a portfolio containing different types of assets, namely those that tend to perform better in periods of higher inflation. Historically certain asset classes have been a more effective ‘hedge’ against inflation than others. For instance stocks (or ‘equities’) fundamentally represent claims against the real assets of the underlying business. If the value of everything the business owns is inflating, so too must its stock price. Their inflation-hedging properties are based on the theory that stocks must compensate investors for increases in general price levels through corresponding increases in stock returns. While the extent of this relationship has been debated for decades, the long term trend (particularly in the US) seems to support the theory. Commodities are often included in portfolios as they tend to be relatively uncorrelated to stocks and bonds. Because commodity prices usually rise when inflation is accelerating, investing in commodities may also provide portfolios with some inflation protection. Certain forms of bonds – known as Index-Linked Bonds – have their principal (underlying value) and coupon payments (interest amount) linked to a general price index. As an inflation hedge, these are most effective when inflation rises faster than expected. A well-diversified portfolio typically contains a number of assets classes such as those listed above. In this context, the case for holding cash as part of an investment plan has its merits. It helps to limit volatility when markets are choppy, acts as an immediate source of liquidity and can be deployed tactically at short notice to take advantage of market movements. So, the key to protecting the real value of wealth is getting the right balance of cash and inflation-proofing investments whilst being mindful of the overall long term objectives. After all, it’s no one’s objective to see the value of their money decline. Avoiding hoarding piles of cash under the mattress might just allow more people to sleep easily at night. The value of investments and the income arising from them can go down as well as up and is not guaranteed, which means that you may not get back what you invested. Past performance is not necessarily a guide to the future. This document does not constitute advice. The above charts are for illustrative purposes only. ‘Figure 1’ and ‘Figure 2’ relate to the period September 1987 to August 2017. Where referred to, Inflation is measured using RPI and Interest Rates measured using the UK Base Rate. The example is based on hypothetical and simulated modelling which has many inherent limitations and is generally prepared with the benefit of hindsight. There are frequently sharp differences between simulated results and the actual results. There are numerous factors related to the markets in general or the implementation of any specific investment strategy which cannot be fully accounted for in the preparation of simulated results and all of which can adversely affect actual results. No guarantee is being made that the stated results will be achieved. Data sourced from Morningstar. Edison Wealth Management Limited is authorised and regulated by the Financial Conduct Authority. The company is registered in England and Wales and its registered address is shown above. The company’s registration number is 06198377 and its VAT registration number is 909 8003 22. This document does not constitute advice. and how we’ve achieved it, please contact us.